Situated in the Spanish Costa Blanca, in between Valencia and Alicante, lies Altea, the village of artists and fishermen. This town in Alicante, a province in the south-eastern region of Spain borders the Mediterranean Sea and lies approximately 50 kilometres northeast of the city of Alicante and 130 kilometres south of Valencia. Altea offers a variety of residential areas where you can find luxurious holiday rental villas, houses, homes and holiday rental apartments. Altea, with almost 20.000 inhabitants, stretches a surface of 34.4 square kilometres and is built on a hill of the Costa Blanca. The fabulous basilica with its resplendent blue domes, graciously crowns the top of the mountain. Built onto the hillside, the old town centre with its many narrow streets and alleys, has become home to many an artist and contains many cosy, characteristic restaurants and bistros. Tourism, having increased significantly on the Costa Blanca from the 1950s onward because of Alteas Mediterranean climate, child-friendly beaches, and characteristic downtown area, is a main means of livelihood for the town and its people. Alteas history goes back many centuries and is characterised by the manifold civilisations that have passed Altea on their way along the course of time. Iberians, Fenicians, Muslims, Greeks, and Romans have all left their marks. It appears that the name Altea is also of Greek origin, as it is thought to have come from the Greek word Altahia, meaning `I heal. Since the town is located at the mouth of the Algar river (meaning 'the river of health'), historians assume that in the old days Altea was a hamlet with strategic, medical, and beneficial value. Situated along a bay, Altea is sealed in by the mountains and the sea. It offers a panoramic view of the picturesque blue domes of the Virgen del Consuelo church, also known as the Nuestra Seora del Consuelo church. This church was built on the hill and stretches high above the historical downtown area. Here you will also find a labyrinth of paved streets and flights of stairs well worth a visit. You are treated to special views looking down the scenic streets and coastline, and absorbing the interesting and beautiful spots of Altea. Cliffs and pebbled beaches vary each other along Alteas 6 kilometres long beach. Little bays and beaches follow in succession from the Barranco del Mascarat up to the pier marking the border with L'Alfs del Pi. Near the old town centre lies the Playa de la Roda beach, while the biggest beach, Cap Blanch, can be found a little further to the south, merging seamlessly with the Albir beach. Further north lies the Playa de Cap Negret beach, a pebble beach with at its end a small inlet with black rocks named Cala del Soio. Another beach favourite is L´Olla, situated right across from its namesake island. Altea's borders are marked by the mountain peak Mascarat and the Sierra de Bernia, where one will find inlets with small pebble beaches such as La Barreta, La Solsida, and La Galera. Museo étnico de la Música (Ethnic museum of Music), with its collection of Carlos Blanco Fadol, is considered one of the worlds most important in its field. A fabulous concert hall offers a variety of drama and musical performances for your enjoyment. In addition there are band competitions and festivals amongst which is the Vila d´Altea International Music Band Competition taking place in November or December and bringing together over 500 musicians. A major fireworks display supported by a smashing show of sights and sounds takes place in the night of the second Saturday of August. Every visitor to Altea is invited to a journey of exploration on foot. The labyrinth of narrow alleys offering a gorgeous view over the Bay of Altea is what has given Altea its fame. On your way you will pass numerous small stores, boots, and galleries offering a wide range of hand-crafted goods. 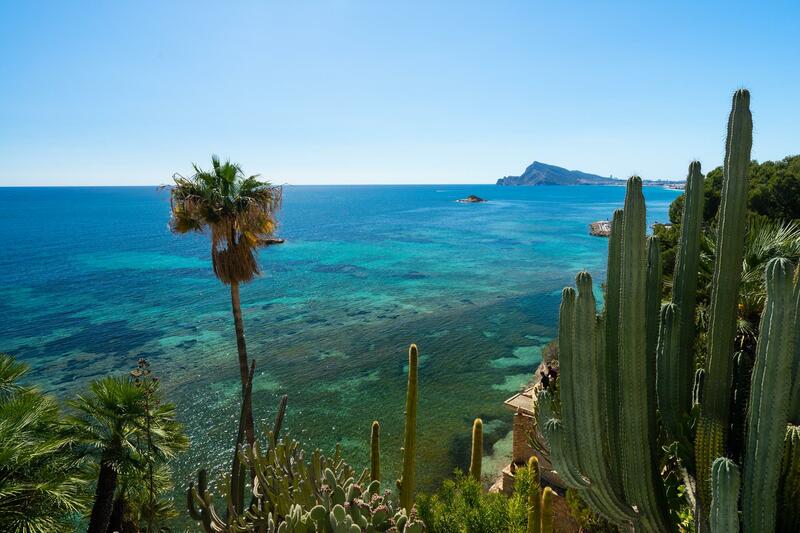 A stone's throw away from Altea lies Cactuslandia, hosting a collection of over a thousand species of cacti and parrots that will most surely amaze you. Multiple amusement parks are found in the direction of Benidorm, such as Terra Mítica , Spain's first Theme Park on The Costa Blanca . This Theme Park is divided into five areas representing five lost civilizations of bygone ages. Its attractions take you back to the myths and legends of these ancient cultures. Aqualandia is a very large Water Theme Park in which young and old alike can have an unforgettable experience in its many swimming pools with springboards, rapid currents, waterfalls, and a stunning range of waterslides. Gorgeous exotic animals and creatures of the sea await you at Safari Park Vergel or Zoopark Mundomar , both of which also host a variety of shows and attractions. The beach at Marina Greenwich offers a variety of sporting facilities. One may scuba dive, fish, surf, attend the sailing school or rent a yacht. Similar activities are offered at the harbour and at the water sports club. Those who love a good game of golf will also feel welcome in Altea. Situated by Altea la Vieja, against the backdrop of the Mountains of Bernia, one discovers the Don Cayo Club de Golf, a nine-hole golf course with an amazing view. Completed in 2005 between la Sierra Finestrat and the Mediterranean Sea, Club de Golf Real de Faula offers a spacious twin eighteen-hole golf course. The area also hosts two 5-star hotels, swimming pools, tennis lanes, a kids club, a fitness centre, restaurants and shopping facilities. The characteristic Spanish dishes are also richly represented in Altea. Most typical for the region, as for all of the Costa Blanca, is -undoubtedly- the rice, which is prepared in over 300 different ways. In the mountains, rice is used as one of the ingredients in the famous stew, and so are pork, sausage, pumpkin, turnip, beets, chick peas and beans Seaside restaurants always offer fish and shellfish on their menus. The countless (fish)restaurants in the harbour serve the most delicious local specialities on offer: Dorade, Lubina a la Sal (in a crust of salt) or grilled with a nip of olive oil, garlic, and lemon juice. The cuisine the Costa Blanca also includes honey-sweet deserts, such as nougat and ice cream from Xixona, grapes, raisins, dates, almond pie, pastry drenched in sweet syrup accompanied by coffee licor from Alcoy and herb licor from the Sierra Mariola. The premium red, light red, and ros wines originate from the Alto Vinalop and Marina Alta districts. Altea, La Nucia, Polop and Alfaz del Pi : The Houses, Villas and Apartments are located in and around Altea and in the adjoining villages La Nucia, Polop and Alfaz del Pi. The towns are situated amongst hilly terrain, surrounded by orchards but definitely not too far away from the coast. Distances: town centre approx. 3 4 kilometres; beach approx. 4 - 8 kilometres; supermarket and restaurants approx. 3 5 kilometres; tennis courts and golf courses approx. 3 8 kilometres from your villa. Cosy fisherman's village next to Altea, with a beautiful sandy beach. Distances: town centre and beach approx. 4 kilometres; supermarket and restaurants approx. 3 kilometres; tennis courts approx. 1 kilometre and golf courses approx. 10 kilometres from your villa. Luxury villa with private pool in Altea, on the Costa Blanca, Spain for 12 persons. 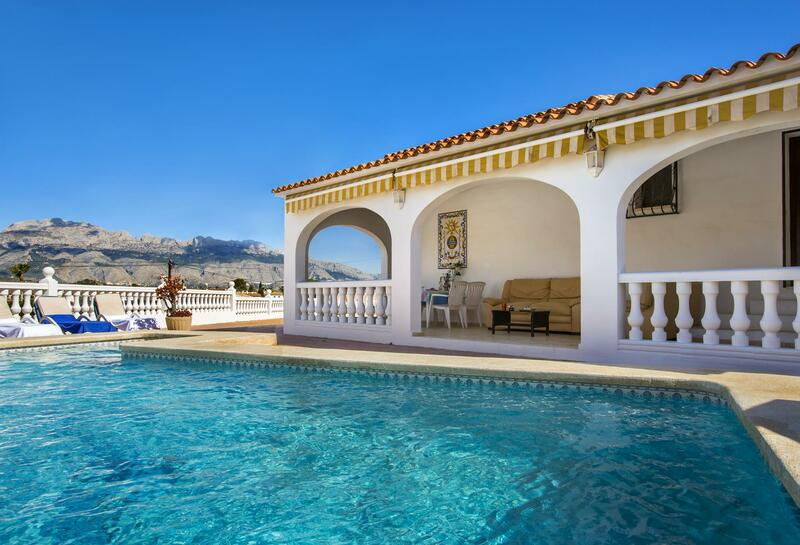 Villa in Alfaz Del Pi, on the Costa Blanca, Spain with private pool for 6 persons. 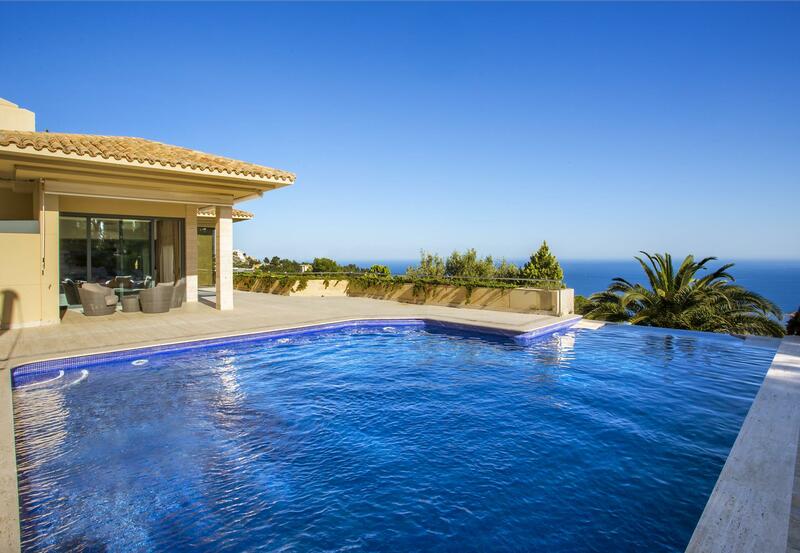 Large and luxury villa in Altea, on the Costa Blanca, Spain with private pool for 14 persons. Large and luxury villa with private pool in Altea, on the Costa Blanca, Spain for 6 persons. Large and luxury villa in Altea, on the Costa Blanca, Spain with private pool for 8 persons.